In the late 1990s, the MP3 became the de facto standard for digital audio files and the networked computer began to claim a significant place in the lives of more and more listeners. The dovetailing of these two circumstances is the basis of a new mode of musical production and distribution where new practices emerge. 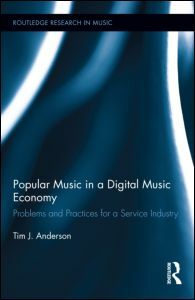 This book is not a definitive statement about what the new music industry is. Rather, it is devoted to what this new industry is becoming by examining these practices as experiments, dedicated to negotiating what is replacing an “object based” industry oriented around the production and exchange of physical recordings. In this new economy, constant attention is paid to the production and licensing of intellectual property and the rise of the “social musician” who has been encouraged to become more entrepreneurial. Finally, every element of the industry now must consider a new type of audience, the “end user”, and their productive and distributive capacities around which services and musicians must orient their practices and investments.